The Alpina AlpinerX is a Swiss made hybrid smartwatch which blends simple fitness tracking with advanced environmental data from its compass, barometer, altimeter and UV monitor. It is a well-engineered wearable, but by not fully committing in any direction - smartness, outdoor tech, fitness tracking - it ends up feeling lost. The Alpina AlpinerX began life as an incredibly successful Kickstarter project, raking in over 1.5 million Swiss francs from backers eager to buy a Swiss made hybrid smartwatch with a chunky, tough, outdoorsy design and features like an altimeter, barometer and UV monitor. As a sign of just how keen backers were, Alpina’s initial target had been just 50,000 francs. Founded in 1883, Geneva-based Alpina is a bona-fide Swiss watchmaker and is currently owned by Frederique Constant, a fellow Swiss firm dipping its toes into the smartwatch waters. This relationship means the AlpinerX has a very similar companion smartphone app to the parent company’s smartwatches, like the Hybrid Manufacture. The AlpinerX is probably better described as an adventure watch than just a hybrid smartwatch. It is unlikely to appear tucked beneath the cuff of your best work shirt, and nor does it feel especially at home in the gym. But dig out the camping gear, remind yourself how to light a fire with some twigs - and reach for the AlpinerX, a smartwatch itching to join you on your next adventure. How much you pay for the Alpina AlpinerX depends on whether you got involved with the Kickstarter project, or are only just now considering your purchase. You see, the earliest backers ordered their AlpinerX for CHF 450 (approximately £355 / $465 / AU$650), but the retail price is now £795 / $895 / $AU$1,350. Clearly, this is a huge difference and puts the product in two rather different sectors of the watch and smartwatch markets. That said, we understand why the ‘real’ price is what it is. This is a Swiss made watch from a reputable century-old brand, one whose parent sells smartwatches with four-figure prices. There’s also a lot going on here; the AlpinerX has a barometer, compass, altimeter, UV sensor and thermometer, plus the usual Bluetooth connection for pairing to your iOS or Android smartphone. A quick glance at the Casio G-Shock range shows you how similarly outdoorsy semi-smartwatches often stray above the £600 / $800 barrier, and even well into four figures, so the AlpinerX isn't alone in being priced high. As we have already said, the Alpina AlpinerX - a name which reminds us of the equally tautologous Ferrari LaFerrari, and not in a good way - is a watch born to live outdoors. The tough looks and bright orange strap of our review unit would look completely at home alongside some carabiners, climbing gear and Bear Grylls. At 45mm wide and 14mm thick, the case is certainly on the large size, but when viewed out of context you’d actually expect it to be even bigger. We have fairly slim wrists, but didn’t feel like the AlpinerX was excessively large. Saying that, we had to swap out the strap for one of our own, as the rubber band is designed to be cut to your size. There’s then a few millimeters of adjustability on the deployment clasp to find the perfect fit. The face is framed by a bi-directional rotating bezel with compass markings to help with navigation, all of which illuminate in low light. The face itself has numbers at 12, three, six and nine o’clock, hour markers in-between, and a digital display takes up most of the lower half. A pair of physical hands tick their way around the face and are adjustable only via the smartphone app, not by the crown. This is because the crown is pressed to scroll through and activate the watch’s various smart features, some of which are also controlled via two buttons located at two and four o’clock. Pressing the crown causes the hands to swing out of the way, giving you a clear view of the display. Alpina is offering a wide range of personalization with the AlpinerX. Every component and detail, which is orange on this example, can be made a different color, and in all the company claims there are over 3,000 combinations, so buyers can create something truly unique. The matte black case has a stealthy, purposeful look to it which we really think suits the outdoor potential of this timepiece, while the stainless steel back includes a neatly engraved mountain range - if any more clues were needed as to the watch’s ambitions. 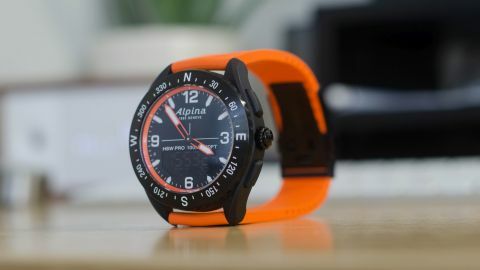 Despite the chunky looks, that fiberglass case means the Alpina AlpinerX is surprisingly light and comfortable to wear. It’s unlikely to slip under the cuff of your work shirts, but looks smart in its own way. The same can be said for the strap, which feels durable yet comfortable and is unlikely to attract too much dust and dirt, as some rubber bands are guilty of. The metal deployment clasp feels very well-made and locks shut with the reassuring clunk of a heavy car door. If you fancy a change, then the AlpinerX accepts any regular 22mm straps. The user interface of the AlpinerX’s display is split into two lines, with the larger top row displaying data and the smaller second row explaining what that data is, so you know which of the watch’s many modes you are currently using. The display has a backlight which can be set to one of three levels of brightness via the smartphone app, but there is no automatic option.